This attractive, sunny holiday home is beside the clear, azure Sicilian Sea. The spacious terrace (100m2) is perfect for enjoying delightful evenings. 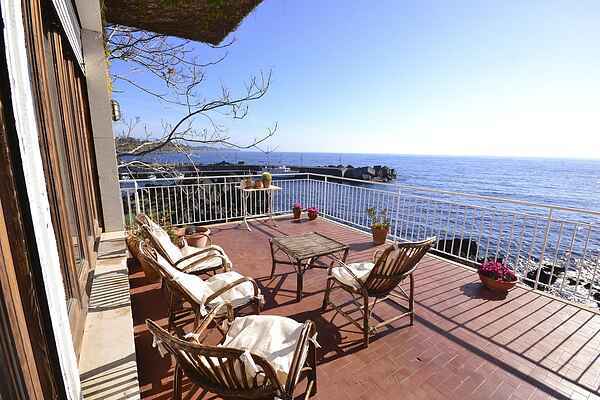 You can admire splendid views of the sea and coast from the terrace. The house is furnished in a modern style. It enjoys plenty of natural light and is well equipped for a superb holiday. The surrounding area is well worth discovering. You can explore the beautiful coastline and visit Mount Etna, the world famous volcano, in its own national park. The many typical Sicilian villages with their wealth of gastronomy and culture are well worth visiting. As are the picturesque towns of Taormina and Giardini Naxos. By the water are mats and a parasol available. You can also use the garden chairs and there is an outdoor shower.